Gateway Business Park is strategically positioned at the crossroads of State Highways 1 & 2. 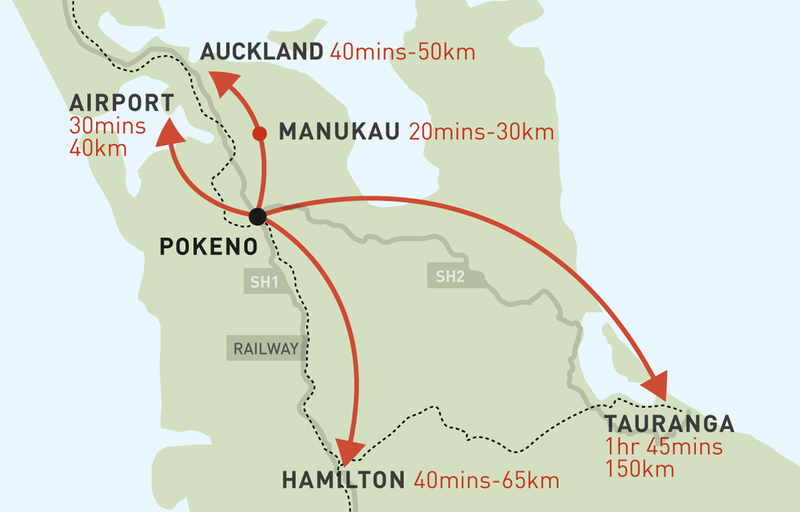 This offers easy access to ports in Auckland and Tauranga, and is just 30 minutes from Auckland International Airport. Travel time to Hamilton will be further reduced when the new Waikato Expressway is complete (estimated 2019). Zoned for Industrial 2 and Light Industrial use, Gateway Business Park offers industrial users greater flexibility with a wider range of permitted activities and more flexible planning controls, such as 24hr operations with noise levels up to 70 dBA Leq. Site configuration is also flexible, with sites from 0.2 - 5 hectares. Competitive land prices - at $220 per square metre. Waikato District Council are pro-actively trying to attract industrial users into their district. This assists in the implementation of industrial facilities in Gateway Business Park. Well underway, the Pokeno Plan Change includes 2000 residential sections to the north, a revitalised town centre, a centralised sports park and 80 hectares of industrial land. Almost 900 residential lots have been sold already and demand is very high. The vision for Pokeno is for an urban village to thrive within a rural backdrop, offering a mix of residential, employment and recreational opportunities. Businesses have the benefit of a town that is growing alongside their needs, where employees can live and work in Pokeno. With Pukekohe, the wider south Auckland area and north Waikato just minutes away, a larger residential workforce is close at hand.